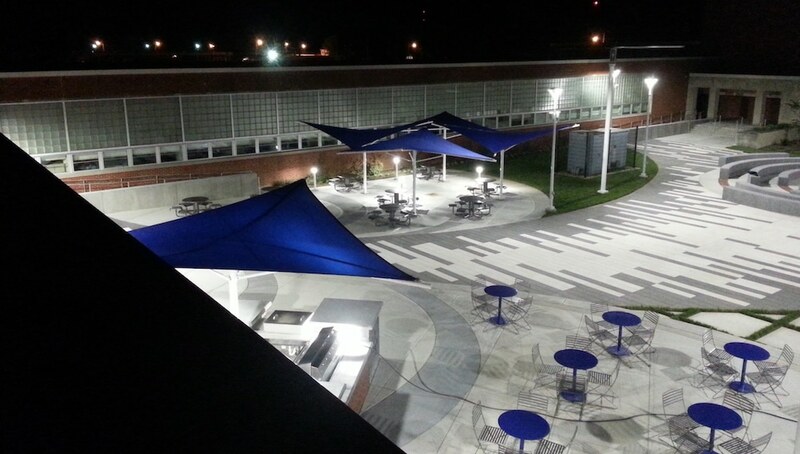 Paducah Tilghman High School Courtyard - Bacon Farmer Workman Engineering & Testing Inc. The purpose of the plaza project was to revitalize a severely under-used existing 20,000 square foot courtyard that once housed a lone flagpole, a historic bronze bell, a few sidewalks which connected doors at its four corners, a pair of memorial icons from graduating classes of years past, a few scrubby plants, a broken grill, and a collection of holes caused by broken drain lines. The space is directly adjacent to and used predominantly by the smaller of the school’s two cafeterias, however, until 2017 students were not permitted in the space at lunch or otherwise – it was essentially “off-limits” because there was nowhere to sit, nothing to draw you into the space, and the doors locked behind you! 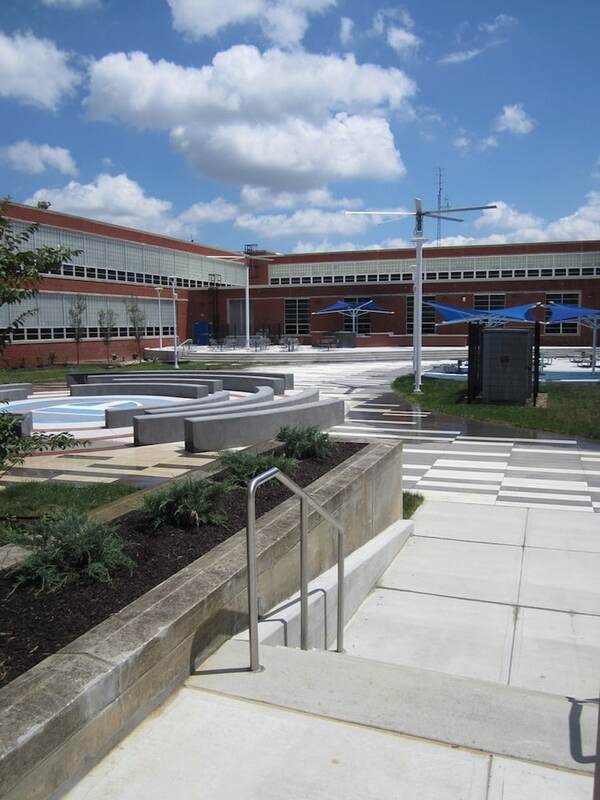 BFW was awarded the contract, through an Owner competition, to re-design and revitalize a severely under-used 20,000 square foot courtyard that once housed a lone flagpole, a few sidewalks which connected doors at its four corners, and a few memorial icons from graduating classes of years past. The project includes an outdoor food service island, raised patio/dining area which doubles as a performance area, an approx. 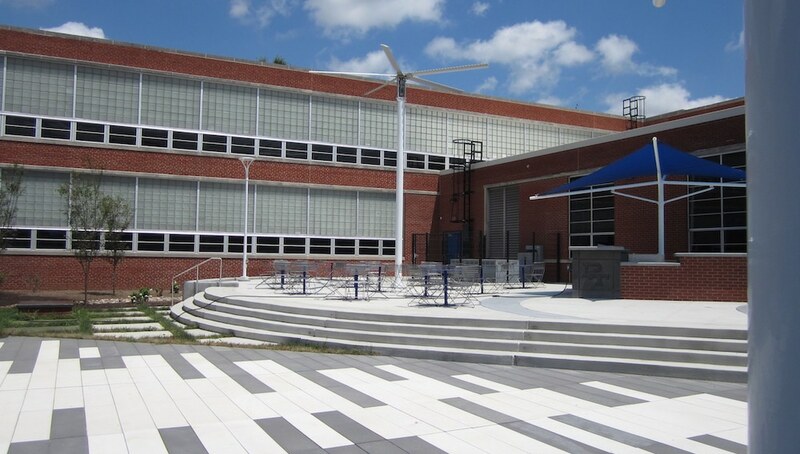 9,000 square ft. tornado-shaped plaza space, various shaded seating opportunities, an outdoor classroom, and usable space during the warmer months of the year via custom-created 20-ft. tall pole-top high-volume low-velocity fans. Notable challenges were the materials and equipment had to either be lifted over the school or through the 6’ breezeway doors and the work had to be completed during school hours. The site also contained three very large transformers that had to be accommodated due to the impracticality of relocating them.